The industrious James Grant recently published a book about the 1920-21 Depression. It has received enthusiastic reviews in the Wall Street Journal and Barron’s, was the subject of an admiring column by Washington Post columnist Robert J. Samuelson, and was celebrated at a Cato Institute panel discussion, luncheon, and book-signing event. The Cato extravaganza elicited a dismissive blog post by Barkley Rosser which was linked to by Paul Krugman on his blog. The Rosser/Krugman tandem provoked an unhappy reply on the Free Banking blog from George Selgin who chaired the Cato panel discussion. And the 1920-21 Depression is now the latest hot topic in the econblogosphere. I am afraid that there are multiple layers of errors and confusion that are being mixed up and compounded in this discussion, errors and confusion derived from basic misunderstandings about how the gold standard operated that have been plaguing the economics profession and the financial world for about two and a half centuries. If you want to understand how the gold standard worked, what you have to read is the book by Ralph Hawtrey entitled – drum roll, please – The Gold Standard. Here are the basic things you need to know about the gold standard. 1 The gold standard operates by creating an equivalence between a currency unit and a fixed amount of gold. 2 The gold standard does not require gold to circulate as money in the form of coins. That was historically the case, but a gold standard can function with no gold coins or even gold certificates. 3 The value of a currency unit and the value of a corresponding weight of gold are necessarily equalized by arbitrage. 4 Equality between a currency unit and a corresponding weight of gold does not necessarily show the direction of causality; the currency unit may determine the value of gold, not the other way around. In other words, making gold the standard of value for currency affects the demand for gold which affects the value of gold. Decisions made by monetary authorities under the gold standard necessarily affect the value of gold, so a gold standard does not somehow make the value of money independent of monetary policy. 5 When more than one country is on a gold standard, the countries share a common price level, because the value of gold is determined in an international market. Keeping those basics in mind, let’s quickly try to understand what was going on in 1920 when the Fed decided to raise its discount rate to the then unprecedented level of 7 percent. But the situation in 1920 was the outcome of the previous six years of World War I that effectively destroyed the gold standard as a functioning institution, even though its existence was in some sense still legally recognized. Under the gold standard, gold was the ultimate way of discharging international debts. In World War I, belligerents had to pay for imports with gold, thus governments amassed all available gold with which to pay for the imports required to support the war effort. Gold coins were melted down and converted to bullion so the gold could be exported. For a private citizen in a belligerent country to demand that the national currency unit be converted to gold would be considered an unpatriotic if not a treasonous act. So the gold standard ceased to function in belligerent countries. In non-belligerent countries, which were busy exporting to the belligerents, the result was a massive inflow of gold, causing a spectacular increase in the amount of gold held by the US Treasury between 1914 and 1917. Other non-belligerents like Sweden and Switzerland experienced similar inflows. Quantity theorists and Monetarists like Milton Friedman habitually misinterpret the wartime inflation, and attributing the inflation to an inflow of gold that increased the money supply, thereby perpetrating the price-specie-flow-mechanism fallacy. What actually happened was that the huge demonetization of gold coins by the belligerents and their export of large quantities of gold to non-belligerent countries in which a free market in gold continued to operate drove down the value of gold. A falling value of gold under a gold standard logically implies rising prices for all other goods and services. Rising prices increased the nominal demand for money, which more or less automatically caused a corresponding adjustment in the quantity of money. A rising price level caused the quantity of money to increase, not the other way around. In 1917, just before the US entered the war, the US, still effectively on a gold standard as gold flowed into the Treasury, had experienced a drastic inflation, like all other gold standard countries, because gold was rapidly losing value, as it was being demonetized and exported by the belligerent countries. But when the US entered the war in 1917, the US, like other belligerents, suspended operation of the gold standard, thereby accelerating the depreciation of gold, forcing the few remaining countries on the gold standard to suspend the gold standard to avoid runaway inflation. Inflationary pressure in the US did increase after entry into the war, but the war-induced fiat inflation, to some extent suppressed or disguised by price controls, was actually slower than inflation in terms of gold. When the war ended, the US went back on the gold standard by again making the dollar convertible into gold at the legal parity. Doing so meant that the US price level in terms of dollars was below the notional (no currency any longer being convertible into gold) world price level in terms of gold. In other belligerent countries, notably Britain, France and Germany, inflation in terms of their national currencies exceeded gold inflation, requiring them to deflate even to restore the legal parity in terms of gold. Thus, the US was the only country in the world that was both willing and able to return to the gold standard at the prewar parity. Sweden and Switzerland could have done so, but preferred to avoid the inflationary consequences of a return to the gold standard. Once the dollar convertibility into gold was restored, arbitrage forced the US price level to rise to so that it would equal the gold price level. The excess of the gold price level over the US price level level explains the anomalous post-war inflation – everyone knows that prices are supposed to fall, not rise, when a war ends — in the US. The rest of the world, then, had to choose between accepting US inflation, by keeping their currencies pegged to the dollar, or allowing their currencies to appreciate against the dollar. The anomalous post-war inflation was caused by the reequilibration of the US price level to the gold price levels, not, as commonly supposed, by Fed inexperience or incompetence. To stop the post-war inflation, the Fed could have simply abandoned the gold standard, or it could have revalued the dollar in terms of gold, by reducing the official dollar price of gold. (I ignore the minor detail that the official dollar price of gold was then determined by statute.) Instead, the Fed — whether knowingly or not I can’t say – chose to increase the value of gold. The method by which it did so was to raise its discount rate, thereby making it easier to obtain dollars by selling gold to the Treasury than to borrow from the Fed. The flood of gold into the Treasury in 1920-21 succeeded in taking a huge amount of gold out of private and public hands, thus driving up the real value of gold, and forcing down the gold price level. That’s when the brutal deflation of 1920-21 started. At some point, the Fed and the Treasury decided that they had had enough, having amassed about 40% of the world’s gold reserves, and began reducing the discount rate, thereby slowing the inflow of gold into the US, and stopping its appreciation. And that’s when and how the dearly beloved, but quite dreadful, depression of 1920-21 came to an end. Josh Hendrickson discusses Milton Friedman’s famous k-percent rule on his blog, using Friedman’s rule as a vehicle for an enlightening discussion of the time-inconsistency problem so brilliantly described by Fynn Kydland and Edward Prescott in a classic paper published 36 years ago. Josh recognizes that Friedman’s rule is imperfect. At any given time, the k-percent rule is likely to involve either an excess demand for cash or an excess supply of cash, so that the economy would constantly be adjusting to a policy induced macroeconomic disturbance. Obviously a less restrictive rule would allow the monetary authorities to achieve a better outcome. But Josh has an answer to that objection. The k-percent rule has often been derided as a sub-optimal policy. Suppose, for example, that there was an increase in money demand. Without a corresponding increase in the money supply, there would be excess money demand that even Friedman believed would cause a reduction in both nominal income and real economic activity. So why would Friedman advocate such a policy? The reason Friedman advocated the k-percent rule was not because he believed that it was the optimal policy in the modern sense of phrase, but rather that it limited the damage done by activist monetary policy. In Friedman’s view, shaped by his empirical work on monetary history, central banks tended to be a greater source of business cycle fluctuations than they were a source of stability. Thus, the k-percent rule would eliminate recessions caused by bad monetary policy. That’s a fair statement of why Friedman advocated the k-percent rule. One of Friedman’s favorite epigrams was that one shouldn’t allow the best to be the enemy of the good, meaning that the pursuit of perfection is usually not worth it. Perfection is costly, and usually merely good is good enough. That’s generally good advice. Friedman thought that allowing the money supply to expand at a moderate rate (say 3%) would avoid severe deflationary pressure and avoid significant inflation, allowing the economy to muddle through without serious problems. But behind that common-sense argument, there were deeper, more ideological, reasons for the k-percent rule. The k-percent rule was also part of Friedman’s attempt to provide a libertarian/conservative alternative to the gold standard, which Friedman believed was both politically impractical and economically undesirable. However, the gold standard for over a century had been viewed by supporters of free-market liberalism as a necessary check on government power and as a bulwark of liberty. Friedman, desiring to offer a modern version of the case for classical liberalism (which has somehow been renamed neo-liberalism), felt that the k-percent rule, importantly combined with a regime of flexible exchange rates, could serve as an ideological substitute for the gold standard. To provide a rationale for why the k-percent rule was preferable to simply trying to stabilize the price level, Friedman had to draw on a distinction between the aims of monetary policy and the instruments of monetary policy. Friedman argued that a rule specifying that the monetary authority should stabilize the price level was too flexible, granting the monetary authority too much discretion in its decision making. The price level is not a variable over which the monetary authority has any direct control. It is a target not an instrument. Specifying a price-level target allows the monetary authority discretion in its choice of instruments to achieve the target. Friedman actually made a similar argument about the gold standard in a paper called “Real and Pseudo Gold Standards.” The price of gold is a target, not an instrument. The monetary authority can achieve its target price of gold with more than one policy. Unless you define the rule in terms of the instruments of the central bank, you have not taken away the discretionary power of the monetary authority. In his anti-discretionary zeal, Friedman believed that he had discovered an argument that trumped advocates of the gold standard . Of course there was a huge problem with this argument, though Friedman was rarely called on it. The money supply, under any definition that Friedman ever entertained, is no more an instrument of the monetary authority than the price level. Most of the money instruments included in any of the various definitions of money Friedman entertained for purposes of his k-percent rule are privately issued. So Friedman’s claim that his rule would eliminate the discretion of the monetary authority in its use of instrument was clearly false. Now, one might claim that when Friedman originally advanced the rule in his Program for Monetary Stability, the rule was formulated the context of a proposal for 100-percent reserves. However, the proposal for 100-percent reserves would inevitably have to identify those deposits subject to the 100-percent requirement and those exempt from the requirement. Once it is possible to convert the covered deposits into higher yielding uncovered deposits, monetary policy would not be effective if it controlled only the growth of deposits subject to a 100-percent reserve requirement. In his chapter on monetary policy in The Constitution of Liberty, F. A. Hayek effectively punctured Friedman’s argument that a monetary authority could operate effectively without some discretion in its use of instruments to execute a policy aimed at some agreed upon policy goal. It is a category error to equate the discretion of the monetary authority in the choice of its policy instruments with the discretion of the government in applying coercive sanctions against the persons and property of private individuals. It is true that Hayek later modified his views about central banks, but that change in his views was at least in part attributable to a misunderstanding. Hayek erroneoulsy believed that his discovery that competition in the supply of money is possible without driving the value of money down to zero meant that competitive banks would compete to create an alternative monetary standard that would be superior to the existing standard legally established by the monetary authority. His conclusion did not follow from his premise. In a previous post, I discussed how Hayek also memorably demolished Friedman’s argument that, although the k-percent rule might not be the theoretically best rule, it would at least be a good rule that would avoid the worst consequences of misguided monetary policies producing either deflation or inflation. John Taylor, accepting the Hayek Prize from the Manhattan Institute, totally embarrassed himself by flagarantly misunderstanding what Hayek was talking about. Here are the two relevant passages from Hayek. The first from his pamphlet, Full Employment at any Price? And in a footnote, Hayek added. So Friedman’s k-percent rule was dumb, really dumb. It was dumb, because it induced expectations that made it unsustainable. As Hayek observed, not only was the theory clear, but it was confirmed by the historical evidence from the nineteenth century. Unfortunately, it had to be reconfirmed one more time in 1982 before the Fed abandoned its own misguided attempt to implement a modified version of the Friedman rule. Just two days before the 50th anniversary of the assassination of John Kennedy, George Selgin offered an ironic endorsement of raising the inflation target, as happened during the Kennedy Administration, in order to reduce unemployment. [T]his isn’t the first time that we’ve been in a situation like the present one. There was at least one other occasion when the U.S. economy, having been humming along nicely with the inflation rate of 2% and an unemployment rate between 5% and 6%, slid into a recession. Eventually the unemployment rate was 7%, the inflation rate was only 1%, and the federal funds rate was within a percentage point of the zero lower bound. Fortunately for the American public, some well-placed (mostly Keynesian) economists came to the rescue, by arguing that the way to get unemployment back down was to aim for a higher inflation rate: a rate of about 4% a year, they figured, should suffice to get the unemployment rate down to 4%–a much lower rate than anyone dares to hope for today. I’m puzzled and frustrated because, that time around, the Fed took the experts’ advice and it worked like a charm. The federal funds rate quickly achieved lift-off (within a year it had risen almost 100 basis points, from 1.17% to 2.15%). Before you could say “investment multiplier” the inflation and unemployment numbers were improving steadily. Within a few years inflation had reached 4%, and unemployment had declined to 4%–just as those (mostly Keynesian) experts had predicted. Oh: I forgot to say what past recession I’ve been referring to. It was the recession of 1960-61. The desired numbers were achieved by 1967. I can’t remember exactly what happened after that, though I’m sure it all went exactly as those clever theorists intended. George has the general trajectory of the story more or less right, but the details and the timing are a bit off. Unemployment rose to 7% in the first half of 1961, and inflation was 1% or less. So reducing the Fed funds rate certainly worked, real GDP rising at not less than a 6.8% annual rate for four consecutive quarters starting with the second quarter of 1961, unemployment falling to 5.5 in the first quarter of 1962. In the following 11 quarters till the end of 1964, there were only three quarters in which the annual growth of GDP was less than 3.9%. The unemployment rate at the end of 1964 had fallen just below 5 percent and inflation was still well below 2%. It was only in 1965, that we see the beginings of an inflationary boom, real GDP growing at about a 10% annual rate in three of the next five quarters, and 8.4% and 5.6% in the other two quarters, unemployment falling to 3.8% by the second quarter of 1966, and inflation reaching 3% in 1966. Real GDP growth did not exceed 4% in any quarter after the first quarter of 1966, which suggests that the US economy had reached or exceeded its potential output, and unemployment had fallen below its natural rate. In fact, recognizing the inflationary implications of the situation, the Fed shifted toward tighter money late in 1965, the Fed funds rate rising from 4% in late 1965 to nearly 6% in the summer of 1966. But the combination of tighter money and regulation-Q ceilings on deposit interest rates caused banks to lose deposits, producing a credit crunch in August 1966 and a slowdown in both real GDP growth in the second half of 1966 and the first half of 1967. With the economy already operating at capacity, subsequent increases in aggregate demand were reflected in rising inflation, which reached 5% in the annus horribilis 1968. Cleverly suggesting that the decision to use monetary expansion, and an implied higher tolerance for inflation, to reduce unemployment from the 7% rate to which it had risen in 1961 was the ultimate cause of the high inflation of the late 1960s and early 1970s, and, presumably, the stagflation of the mid- and late-1970s, George is inviting his readers to conclude that raising the inflation target today would have similarly disastrous results. Well, that strikes me as quite an overreach. Certainly one should not ignore the history to which George is drawing our attention, but I think it is possible (and plausible) to imagine a far more benign course of events than the one that played itself out in the 1960s and 1970s. The key difference is that the ceilings on deposit interest rates that caused a tightening of monetary policy in 1966 to produce a mini-financial crisis, forcing the 1966 Fed to abandon its sensible monetary tightening to counter inflationary pressure, are no longer in place. Nor should we forget that some of the inflation of the 1970s was the result of supply-side shocks for which some monetary expansion (and some incremental price inflation) was an optimal policy response. The disastrous long-term consequences of Nixon’s wage and price controls should not be attributed to the expansionary monetary policy of the early 1960s. We should be careful to get out of an experience only the wisdom that is in it and stop there lest we be like the cat that sits down on a hot stove lid. She will never sit down on a hot stove lid again and that is well but also she will never sit down on a cold one anymore. In his gallant, but in my opinion futile, attempts to defend Milton Friedman against the scandalous charge that Friedman was, gasp, a Keynesian, if not in his policy prescriptions, at least in his theoretical orientation, Scott Sumner has several times referred to the contrast between the implication of the IS-LM model that expansionary monetary policy implies a reduced interest rate, and Friedman’s oft-repeated dictum that high interest rates are a sign of easy money, and low interest rates a sign of tight money. This was a very clever strategic and rhetorical move by Scott, because it did highlight a key difference between Keynesian and Monetarist ideas while distracting attention from the overlap between Friedman and Keynesians on the basic analytics of nominal-income determination. Alghough I agree with Scott that Friedman’s dictum that high interest rates distinguishes him from Keynes and Keynesian economists, I think that Scott leaves out an important detail: Friedman’s dictum also distinguishes him from just about all pre-Keynesian monetary economists. Keynes did not invent the terms “dear money” and “cheap money.” Those terms were around for over a century before Keynes came on the scene, so Keynes and the Keynesians were merely reflecting the common understanding of all (or nearly all) economists that high interest rates were a sign of “dear” or “tight” money, and low interest rates a sign of “cheap” or “easy” money. For example, in his magisterial A Century of Bank Rate, Hawtrey actually provided numerical bounds on what constituted cheap or dear money in the period he examined, from 1844 to 1938. Cheap money corresponded to a bank rate less than 3.5% and dear money to a bank rate over 4.5%, 3.5 to 4.5% being the intermediate range. Take the period just leading up to the Great Depression, when Britain returned to the gold standard in 1925. The Bank of England kept its bank rate over 5% almost continuously until well into 1930. Meanwhile the discount rate of the Federal Reserve System from 1925 to late 1928 was between 3.5 and 5%, the increase in the discount rate in 1928 to 5% representing a decisive shift toward tight money that helped drive the world economy into the Great Depression. We all know – and certainly no one better than Scott – that, in the late 1920s, the bank rate was an absolutely reliable indicator of the stance of monetary policy. So what are we to make of Friedman’s dictum? I think that the key point is that traditional notions of central banking – the idea of “cheap” or “dear” money – were arrived at during the nineteenth century when almost all central banks were operating either in terms of a convertible (gold or silver or bimetallic) standard or with reference to such a standard, so that the effect of monetary policy on prices could be monitored by observing the discount of the currency relative to gold or silver. In other words, there was an international price level in terms of gold (or silver), and the price level of every country could be observed by looking at the relationship of its currency to gold (or silver). As long as convertibility was maintained between a currency and gold (or silver), the price level in terms of that currency was fixed. If a central bank changed its bank rate, as long as convertibility was maintained (and obviously most changes in bank rate occurred with no change in convertibility), the effect of the change in bank rate was not reflected in the country’s price level (which was determined by convertibility). So what was the point of a change in bank rate under those circumstances? Simply for the central bank to increase or decrease its holding of reserves (usually gold or silver). By increasing bank rate, the central bank would accumulate additional reserves, and, by decreasing bank rate, it would reduce its reserves. A “dear money” policy was the means by which a central bank could add to its reserve and an “easy money” policy was the means by which it could disgorge reserves. So the idea that a central bank operating under a convertible standard could control its price level was based on a misapprehension — a widely held misapprehension to be sure — but still a mistaken application of the naive quantity theory of money to a convertible monetary standard. Nevertheless, although the irrelevance of bank rate to the domestic price level was not always properly understood in the nineteenth century – economists associated with the Currency School were especially confused on this point — the practical association between interest rates and the stance of monetary policy was well understood, which is why all monetary theorists in the nineteenth and early twentieth centuries agreed that high interest rates were a sign of dear money and low interest rates a sign of cheap money. Keynes and the Keynesians were simply reflecting the conventional wisdom. Now after World War II, when convertibility was no longer a real constraint on the price level (despite the sham convertibility of the Bretton Woods system), it was a true innovation of Friedman to point out that the old association between dear (cheap) money and high (low) interest rates was no longer a reliable indicator of the stance of monetary policy. However, as a knee-jerk follower of the Currency School – the 3% rule being Friedman’s attempt to adapt the Bank Charter Act of 1844 to a fiat currency, and with equally (and predictably) lousy results – Friedman never understood that under the gold standard, it is the price level which is fixed and the money supply that is endogenously determined, which is why much of the Monetary History, especially the part about the Great Depression (not, as Friedman called it, “Contraction,” erroneously implying that the change in the quantity of money was the cause, rather than the effect, of the deflation that characterized the Great Depression) is fundamentally misguided owing to its comprehensive misunderstanding of the monetary adjustment mechanism under a convertible standard. PPS I also apologize for not responding to recent comments, I will try to rectify that transgression over the next few days. John Tamny, whose economic commentary I usually take with multiple grains of salt, writes an op-ed about the price of gold in today’s Wall Street Journal, a publication where the probability of reading nonsense is dangerously high. Amazingly, Tamny writes that the falling price of gold is a good sign for the US economy. “The recent decline in the price of gold, ” Tamny informs us, “is cause for cautious optimism.” What’s this? A sign that creeping sanity is infiltrating the editorial page of the Wall Street Journal? Is the Age of Enlightenment perhaps dawning in America? Um, not so fast. After all, we are talking about the Wall Street Journal editorial page. Yep, it turns out that Tamny is indeed up to his old tricks again. The precious metal has long been referred to as “the golden constant” for its steady value. An example is the skyrocketing price of gold in the 1970s, which didn’t so much signal a spike in gold’s value as it showed the decline of the dollar in which it was priced. If gold’s constancy as a measure of value is doubted, consider oil: In 1971 an ounce of gold at $35 bought 15 barrels, in 1981 an ounce of gold at $480 similarly bought 15 barrels, and today an ounce once again buys a shade above 15. OMG! The golden constant! Gold was selling for about $35 an ounce in 1970 rose to nearly $900 an ounce in 1980, fell to about $250 an ounce in about 2001, rose back up to almost $1900 in 2011 and is now below $1400, and Mr. Tamny thinks that the value of gold is constant. Give me a break. Evidently, Mr. Tamny attaches deep significance to the fact that the value of gold relative to the value of a barrel of oil was roughly 15 barrels of oil per ounce in 1971, and again in 1981, and now, once again, is at roughly 15 barrels per ounce, though he neglects to inform us whether the significance is economic or mystical. So I thought that I would test the constancy of this so-called relationship by computing the implied exchange rate between oil and gold since April 1968 when the gold price series maintained by the Federal Reserve Bank of St. Louis begins. The chart below, derived from the St. Louis Fed, plots the monthly average of the number of barrels of oil per ounce of gold from April 1968 (when it was a bit over 12) through March 2013 (when it was about 17). 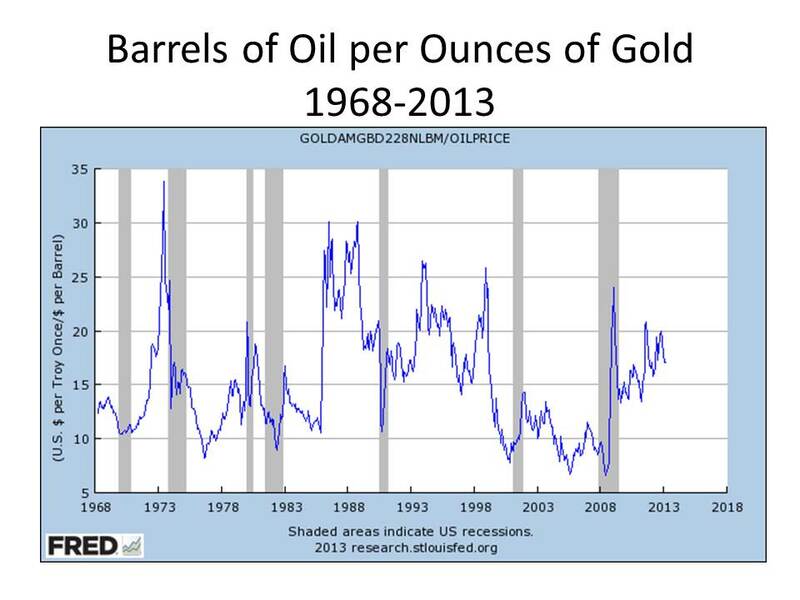 But as the graph makes clear the relative price of gold to oil has been fluctuating wildly over the past 45 years, hitting a low of 6.6 barrels of oil per ounce of gold in June 2008, and a high of 33.8 barrels of oil per ounce of gold in July 1973. And this graph is based on monthly averages; plotting the daily fluctuations would show an even greater amplitude. Do Mr. Tamny and his buddies at the Wall Street Journal really expect people to buy this nonsense? This is what happens to your brain when you are obsessed with gold. If you think that the US and the world economies have been on a wild ride these past five years, imagine what it would have been like if the US or the world price level had been fluctuating as the relative price of gold in terms of oil has been fluctuating over the same time period. And don’t even think about what would have happened over the past 45 years under Mr. Tamny’s ideal, constant, gold-based monetary standard. Let’s get this straight. The value of gold is entirely determined by speculation. The current value of gold has no relationship — none — to the value of the miniscule current services gold now provides. It is totally dependent on the obviously not very well-informed expectations of people like Mr. Tamny. 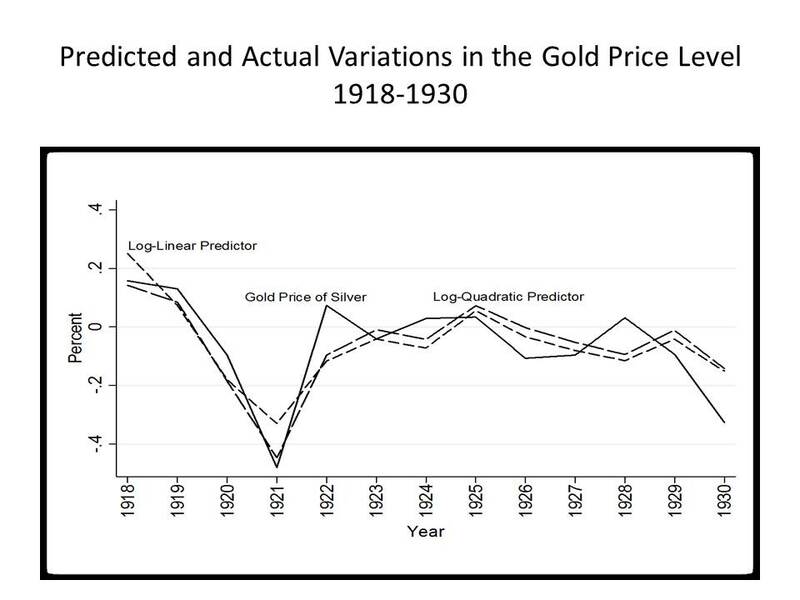 Gold indeed had a relatively stable value over long periods of time when there was a gold standard, but that was largely due to fortuitous circumstances, not the least of which was the behavior of national central banks that would accumulate gold or give up gold as needed to prevent the value of gold from fluctuating as wildly as it otherwise would have. When, as a result of the First World War, gold was largely demonetized, prices were no longer tied to gold. Then, in the 1920s, when the world tried to restore the gold standard, it was beyond the capacity of the world’s central banks to recreate the gold standard in such a way that their actions smoothed the inevitable fluctuations in the value of gold. Instead, their actions amplified fluctuations in the value of the gold, and the result was the greatest economic catastrophe the world had seen since the Black Death. To suggest another restoration of the gold standard in the face of such an experience is sheer lunacy. But, as members of at least one of our political parties can inform you, just in case you have been asleep for the past decade or so, the lunatic fringe can sometimes transform itself . . . into the lunatic mainstream. Exactly how Hawtrey’s position first articulated in a professional economics journal four years earlier became the orthodox Treasury View in March 1929 is far from clear. Alan Gaukroger in his doctoral dissertation on Hawtrey’s career at the Treasury provides much helpful background information. Apparently, Hawtrey’s position was elevated into the “orthodox Treasury View” because Churchill required some authority on which to rely in opposing Liberal agitation for public-works spending which the Conservative government and Churchill’s top Treasury advisers and the Bank of England did not want to adopt for a variety of reason. The “orthodox Treasury View” provided a convenient and respectable doctrinal cover with which to clothe their largely political opposition to public-works spending. This is not to say that Churchill and his advisers were insincere in taking the position that they did, merely that Churchill’s position emerged from on-the-spot political improvisation in the course of which Hawtrey’s paper was dredged up from obscurity rather than from applying any long-standing, well-established, Treasury doctrine. For an illuminating discussion of all this, see chapter 5 (pp. 234-75) of Gaukroger’s dissertation. I have seen references to the Treasury View for a very long time, probably no later than my first year in graduate school, but until a week or two ago, I had never actually read Hawtrey’s 1925 paper. Brad Delong, who has waged a bit of a campaign against the Treasury View on his blog as part of his larger war against opponents of President Obama’s stimulus program, once left a comment on a post of mine about Hawtrey’s explanation of the Great Depression, asking whether I would defend Hawtrey’s position that public-works spending would not increase employment. I think I responded by pleading ignorance of what Hawtrey had actually said in his 1925 article, but that Hawtrey’s explanation of the Great Depression was theoretically independent of his position about whether public-works spending could increase employment. So in a sense, this post is partly belated reply to Delong’s query. Perhaps if Professsor Pigou had carried the argument so far, he would have become convinced that the distorting veil of money cannot be put aside. As well might he play lawn tennis without the distorting veil of the net. All the skill and all the energy emanate from the players and are transmitted through the racket to the balls. The net does nothing; it is a mere limiting condition. So is money. Employment is given by producers. They produce in response to an effective demand for products. Effective demand means ultimately money, offered by consumers in the market. A wonderful insight, marvelously phrased, but I can’t really tell, beyond Pigou’s desire to ignore the “distorting veil of money,” how it relates to anything Pigou wrote. At any rate, from here Hawtrey proceeds to his substantive argument, positing “a community in which there is unemployment.” In other words, “at the existing level of prices and wages, the consumers’ outlay [Hawtrey’s term for total spending] is sufficient only to employ a part of the productive resources of the country.” Beyond the bare statement that spending is insufficient to employ all resources at current prices, no deeper cause of unemployment is provided. The problem Hawtrey is going to address is what happens if the government borrows money to spend on new public works? Hawtrey starts by assuming that the government borrows from private individuals (rather than from the central bank), allowing Hawtrey to take the quantity of money to be constant through the entire exercise, a crucial assumption. The funds that the government borrows therefore come either from that portion of consumer income that would have been saved, in which case they are not available to be spent on whatever private investment projects they would otherwise have financed, or they are taken from idle balances held by the public (the “unspent margin” in Hawtrey’s terminology). If the borrowed funds are obtained from cash held by the public, Hawtrey argues that the public will gradually reduce spending in order to restore their cash holdings to their normal level. Thus, either way, increased government spending financed by borrowing must be offset by a corresponding reduction in private spending. Nor does Hawtrey concede that there will necessarily be a temporary increase in spending, because the public may curtail expenditures to build up their cash balances in anticipation of lending to the government. Moreover, there is always an immediate effect on income from any form of spending (Hawtrey understood the idea of a multiplier effect, having relied on it in his explanation of how an increase in the stock of inventories held by traders in response to a cut in interest rates would produce a cumulative increase in total income and spending), so if government spending on public works reduces spending elsewhere, there is no necessary net increase in total spending even in the short run. Here is how Hawtrey sums up the crux of his argument. Stated in these terms, the argument suggests another possible mechanism by which government expenditure could increase total income and employment: an increase in velocity. And Hawtrey explicitly recognized it. In other words, Hawtrey did indeed recognize the problem of a zero lower bound (in later works he called it a “credit deadlock”) in which the return to holding money exceeds the expected return from holding real capital assets, and that, in such circumstances, government spending could cause aggregate spending and income to increase. Having established that, absent any increase in cash balances, government spending would have stimulative effects only at the zero lower bound, Hawtrey proceeded to analyze the case in which government spending increased along with an increase in cash balances. After making this concession, however, Hawtrey added a qualification, which has provoked the outrage of many Keynesians. What has been shown is that expenditure on public works, if accompanied by a creation of credit, will give employment. But then the same reasoning shows that a creation of credit unaccompanied by any expenditure on public works would be equally effective in giving employment. The public works are merely a piece of ritual, convenient to people who want to be able to say that they are doing something, but otherwise irrelevant. To stimulate an expansion of credit is usually only too easy. To resort for the purpose to the construction of expensive public works is to burn down the house for the sake of the roast pig. That applies to the case where the works are financed by credit creation. In the practical application of the policy, however, this part of the programme is omitted. The works are started by the Government at the very moment when the central bank is doing all it can to prevent credit from expanding. The Chinaman burns down his house in emulation of his neighbour’s meal of roast pork, but omits the pig. Keynesians are no doubt offended by the dismissive reference to public-works spending as “a piece of ritual.” But it is worth recalling the context in which Hawtrey published his paper in 1925 (read to the Economics Club on February 10). Britain was then in the final stages of restoring the prewar dollar-sterling parity in anticipation of formally reestablishing gold convertibility and the gold standard. In order to accomplish this goal, the Bank of England raised its bank rate to 5%, even though unemployment was still over 10%. Indeed, Hawtrey did favor going back on the gold standard, but not at any cost. His view was that the central position of London in international trade meant that the Bank of England had leeway to set its bank rate, and other central banks would adjust their rates to the bank rate in London. Hawtrey may or may not have been correct in assessing the extent of the discretionary power of the Bank of England to set its bank rate. But given his expansive view of the power of the Bank of England, it made no sense to Hawtrey that the Bank of England was setting its bank rate at 5% (historically a rate characterizing periods of “dear money” as Hawtrey demonstrated subsequently in his Century of Bank Rate) in order to reduce total spending, thereby inducing an inflow of gold, while the Government simultaneously initiated public-works spending to reduce unemployment. The unemployment was attributable to the restriction of spending caused by the high bank rate, so the obvious, and most effective, remedy for unemployment was a reduced bank rate, thereby inducing an automatic increase in spending. Given his view of the powers of the Bank of England, Hawtrey felt that the gold standard would take care of itself. But even if he was wrong, he did not feel that restoring the gold standard was worth the required contraction of spending and employment.